I’ve cats all my life and only twice have I had to help a cat pass his stools, fur ball gel, more Metamucil fiber or a stool softening suppository method in an emergency. Caesar recently had to have all three remedies because he was trying to pass two stools at once that while the stools were wet and not too hard, they were very painful to pass and he would vomit because of the pain. Now his stools come out normally and he no longer has pain followed by vomiting. I contribute this kind of stool problem to getting older and needing more fiber because I have found too that older cats cannot digest their fur as easily as they used to and it packs up in their digestive system causing stools to form harder and hard to pass; I had Caesar and Alex’s’ stools analyzed last month and it was more hair then waste. Older humans get constipated from lack of fiber, so age most diffidently contributes to this painful. Caesar and Alex now get a little sprinkle of plain Metamucil mixed in their meals with some extra warm water. Now Caesar is passing softer yet firm stools every 2-3 days like he should and all formed like tootsie rolls :). No more hard as nails double stools! Ramses had a mega colon from old age; not a serious one I was told (a stage 1) but by the severe pain he was in for a not so serious one I totally feared the thought of his mega colon growing larger. 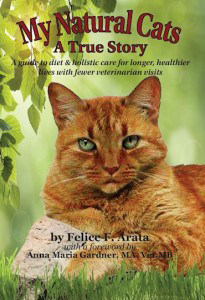 In my book, “My Natural Cats”, I mention how he was treated successfully various homeopathic ways by Dr Gardner which completely stopped his pain and helped him to pass stools normally for the rest of his life. So if your kitty has a problem passing stools like mind did, find out the cause and treat with natural remedies like I did twice.